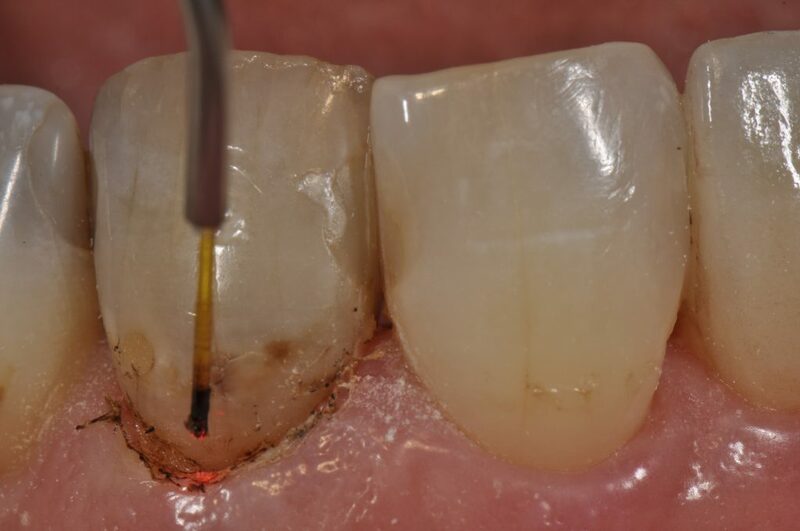 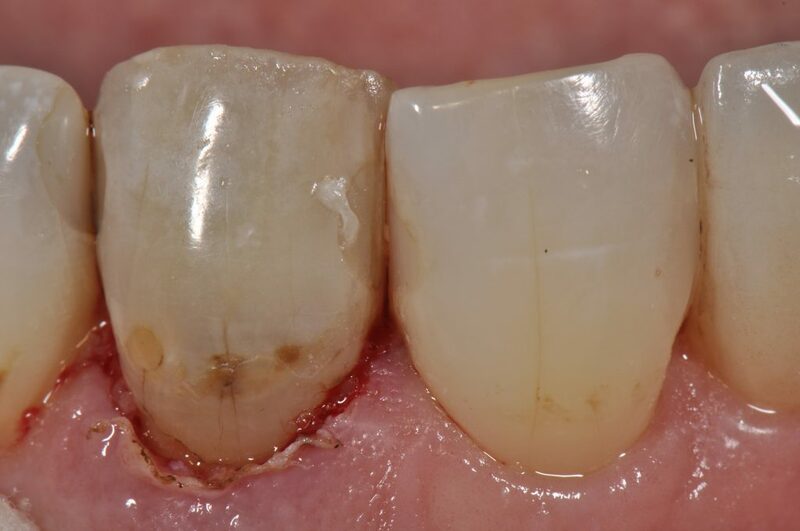 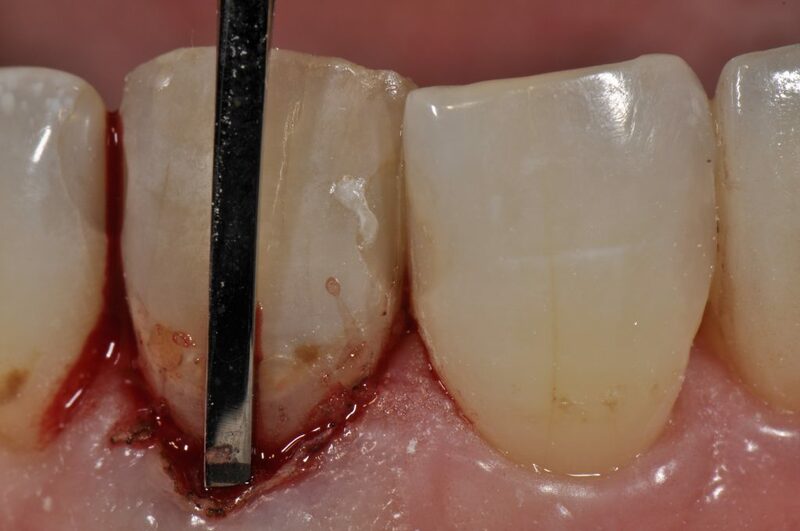 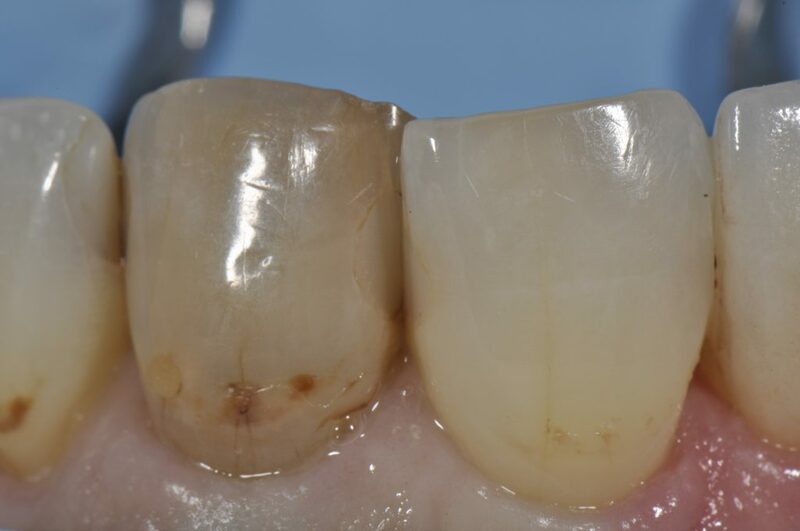 This was an extremely difficult case on a root-filled tooth 21 with an existing post and core. 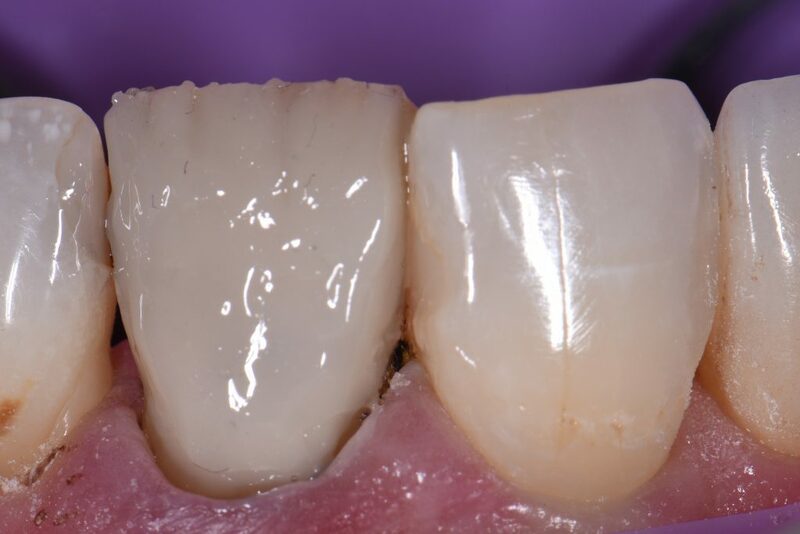 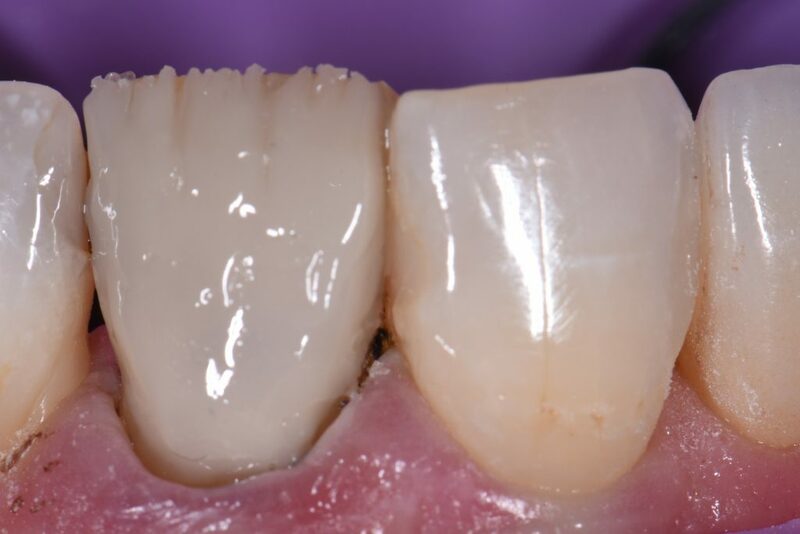 The latter feature obviated the possibility of using internal bleaching to lighten the base color without removing the post/core, which the patient did not want to do. 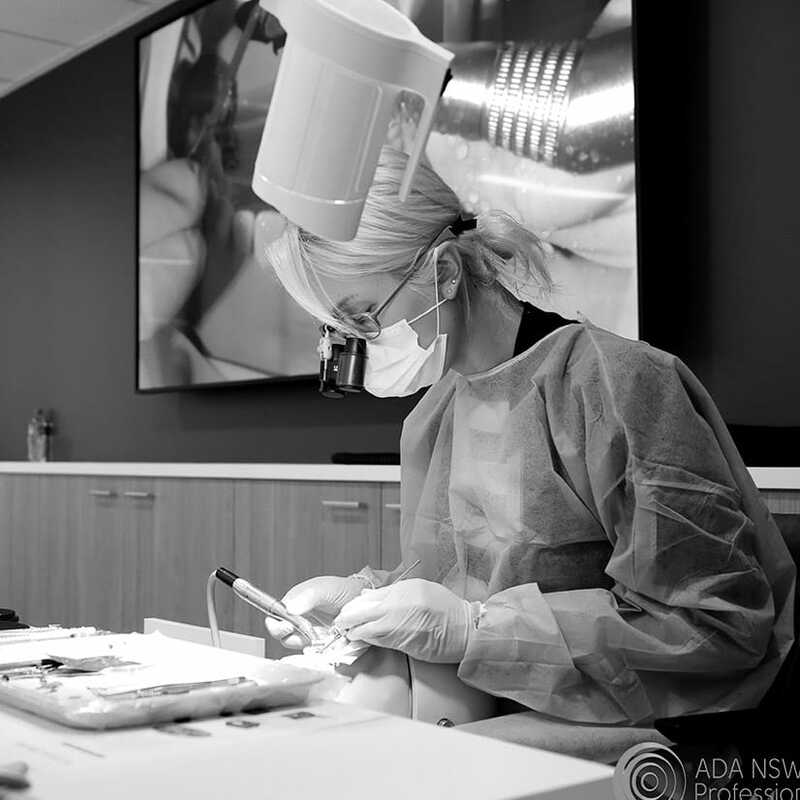 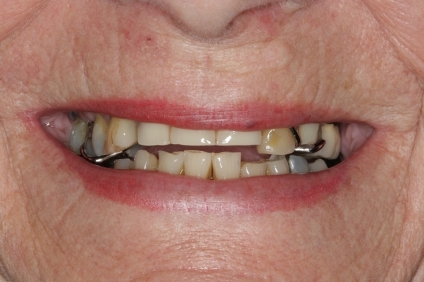 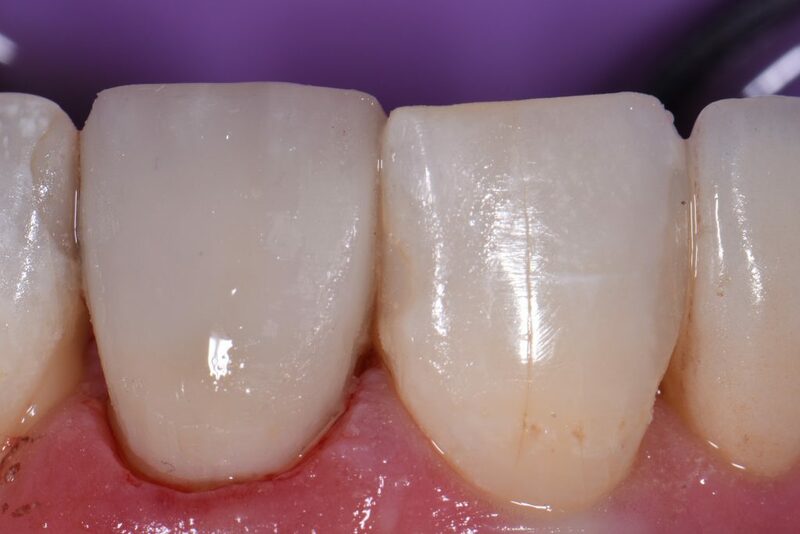 Following an initial surgical appointment to complete osseous recontouring and esthetic crown lengthening on tooth 9 to match 8 better, approximately 3 weeks of healing was permitted. 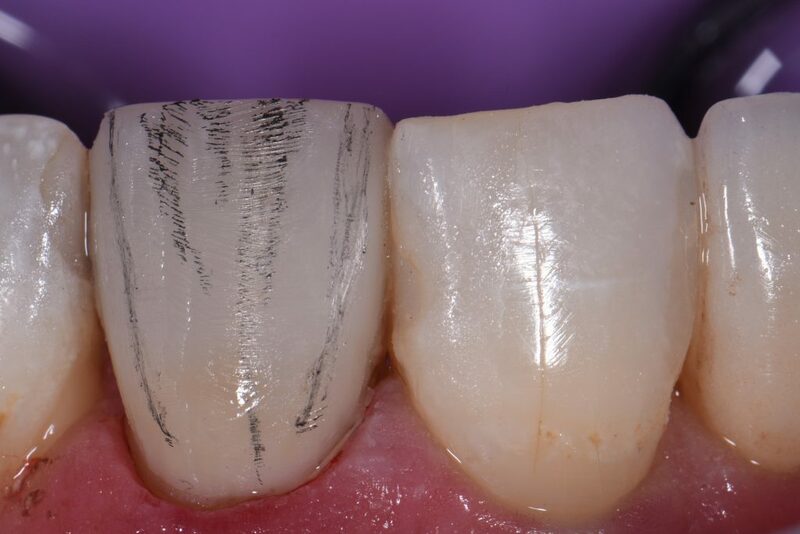 The Ultradent Gemini dual-wavelength diode was utilize both efficient cutting and therapeutic properties of the 810nm (carbonization allows this to be an extremely efficient cutter and coagulator) and 980nm (able to cut without carbonization of the tip due to higher affinity to water molecules, and touted light therapy benefits in edema reduction via vasodilation, energy activation of healing via vascular and metabolic stimulation of new tissue growth). 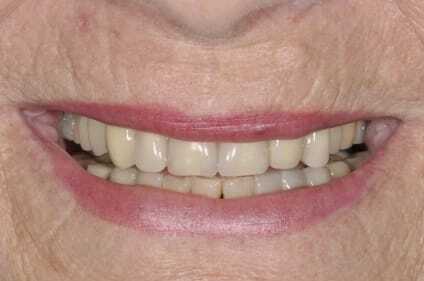 Using both wavelengths together is a first for any device much less company, and offers a synergistic effect. 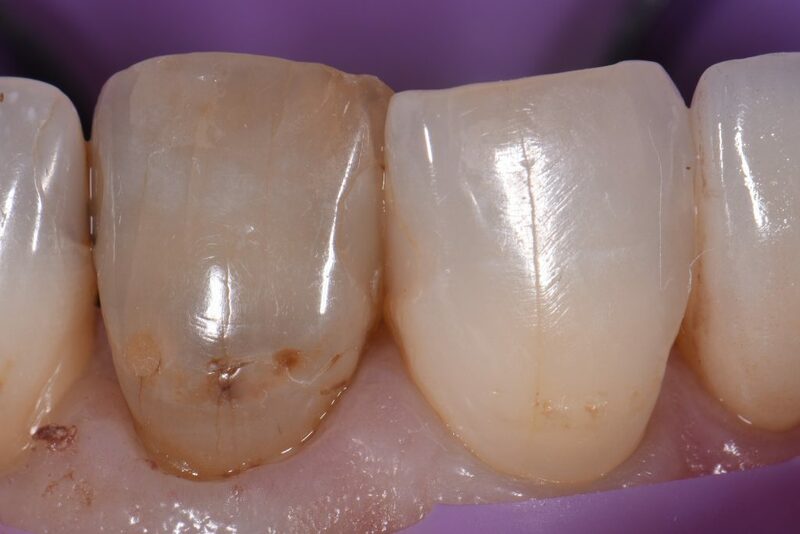 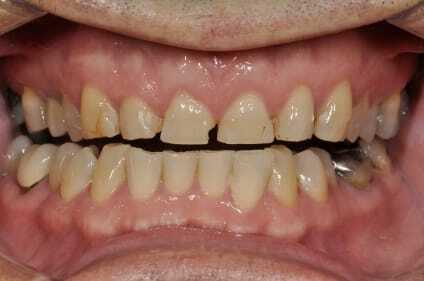 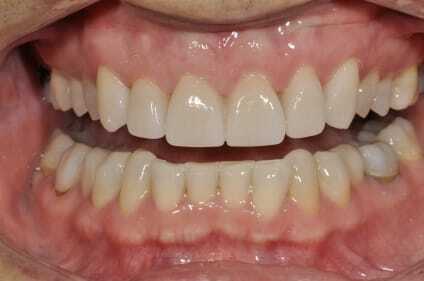 Following this, a veneer prep was completed on 21, with approximately 0.5mm cervical and axial reduction. 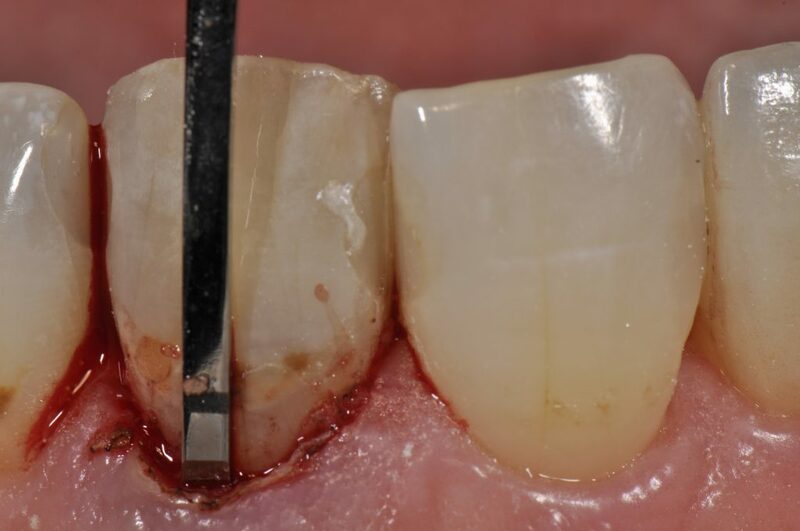 Micro air abrasion (27 micron aluminum oxide) was used before an Ultrapak #00 dry cord was packed on the buccal to control crevicular fluid. 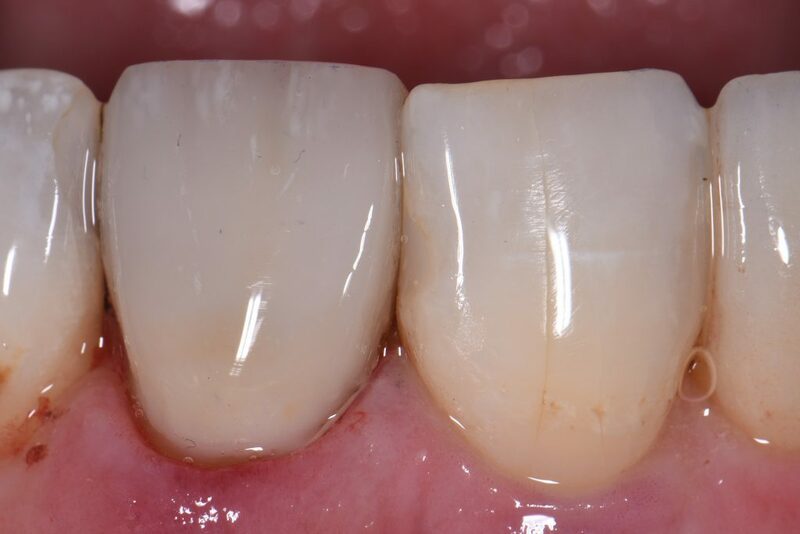 A total etch technique was undertaken using 33% H3PO4 (aq) (Ultra-Etch), 2% chlorhexidine soak (Vista), adhesive (Peak Universal) use before restoration with pre-dehydration shades: A1, A2, IrB, PN with some orange and white tints to accentuate cervical warmth and “crack” appearance subsurface. 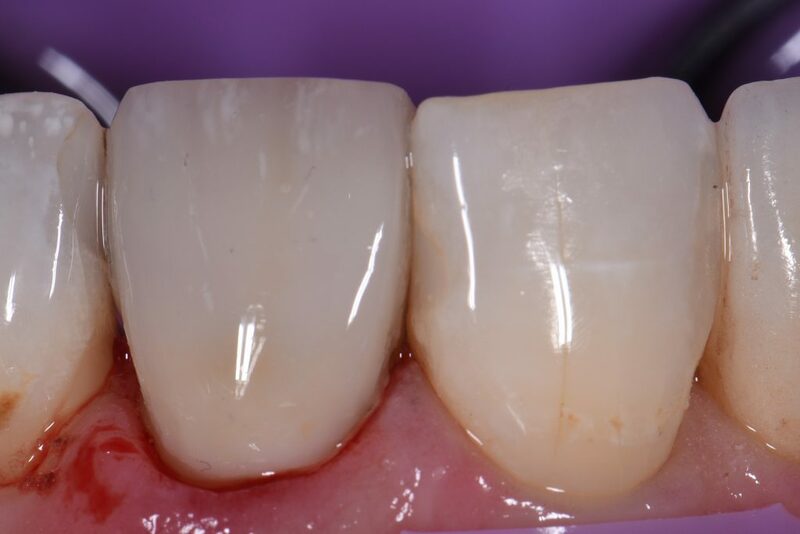 Three ultra-thin layers of a masking liner was used cervically to try to lift the value in this area. 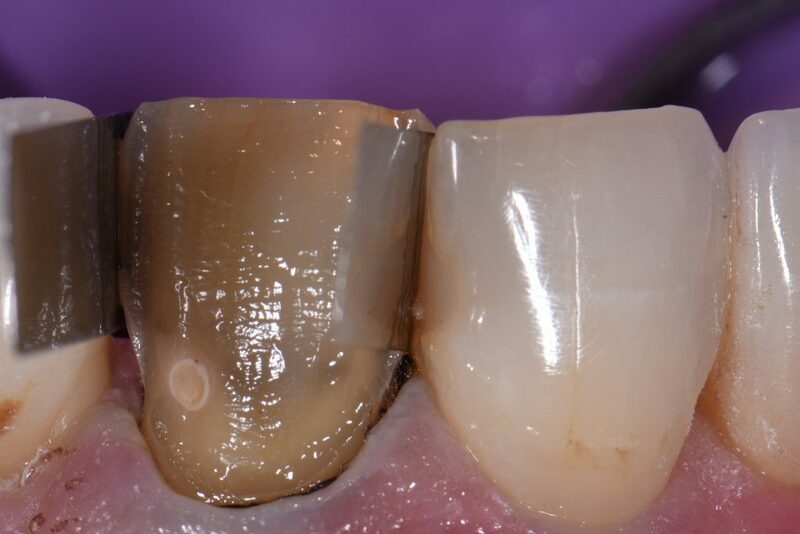 All in all, we are approaching the ideal shade quality of the natural tooth despite the extreme initial color difference.